Experience the comfort and peace of home with Belvedere Seniors Living. As a family owned and operated business, Belvedere Seniors Living understands the importance of personal relationships in a senior’s life. We are committed to providing seniors’ accommodation and supports within an environment that looks and feels like home. Belvedere Seniors Living offers private pay Independent and Complex Care services as well as partnering with Fraser Health, BC Housing and other provincial or federal agencies, and insurance companies to provide excellent accommodations to seniors. 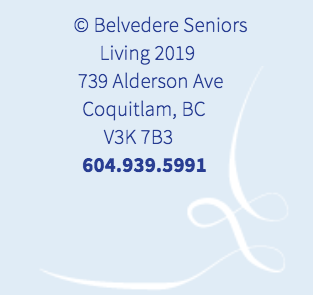 Belvedere Seniors Living is owned and operated by the Evertt family, who have been committed to providing seniors’ services and managing care residences in BC since 1952. Berton Evertt took over the family business in 1984 and, shortly thereafter, expanded it with the acquisition of Cherington Place in Surrey, and subsequently Deer Lake Private Hospital in Burnaby in 1989. Today, Belvedere Seniors Living remains committed to providing seniors with accommodation, services and supports within a home-like setting. We currently operate Complex Care centres in Coquitlam and Surrey, as well as a Registered Assisted and Independent Living Centre in Coquitlam. Belvedere Seniors Living is pleased to be announce the opening of our fourth community – Suncrest Retirement Community in South Surrey offering both Independent Living and Complex Care.